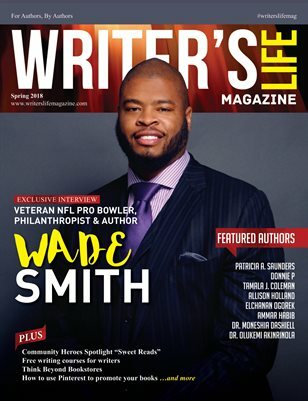 Our spring cover star, 12 year Veteran NFL Pro Bowler, Philanthropist & Children’s Book Author, Wade Smith has children all across Texas Reading With The Pros. In this issue, Smith shares the inspiration behind his children’s books, as well as the reason for his desire to promote literacy and bullying awareness among young people. Plus, we've got tons of great writing tips, exclusive author interviews, and books by some of the most sought-after indie authors and publishers around! !